August 2, 2012  Will tomorrow's U.S. supermarket stock 10 kinds of potatoes? Potato geneticist Chuck Brown hopes so. 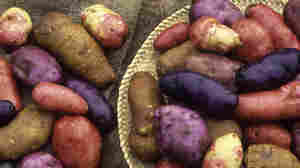 He's been working to introduce the American market to purple, orange and red potato varieties, and bring back the sizzle potatoes once enjoyed.